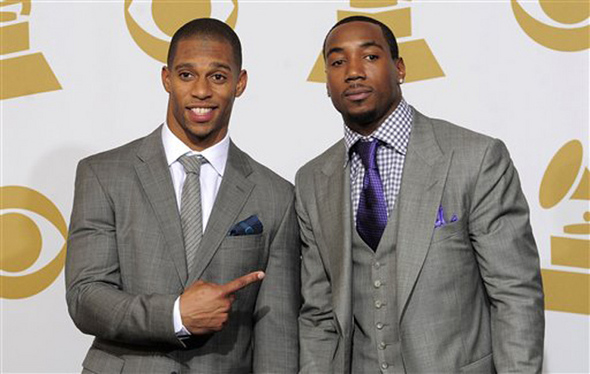 Posted on Mon, Feb 13, 2012 : 8:47 a.m.
New York Giants receivers Victor Cruz, left, and Mario Manningham pose backstage Sunday at the Grammy Awards. It was another busy Sunday for Super Bowl champion wide receivers Mario Manningham and Victor Cruz. They had prime seats at the 54th Grammys, presented the Grammy Award for Best Rock Performance to the Foo Fighters for "Walk" and posed for photos backstage. And they were part of the backstage interviews. Manningham, a former Michigan receiver now best known for his key fourth-quarter Super Bowl catch in the New York Giants' game-winning drive against the New England Patriots, said he enjoyed meeting LL Cool J. As for football, Manningham says his immediate plan is to do some "chilling." "Need to go somewhere and just relax," he said backstage. "Do some relaxing and don't think about football for a while." Tue, Feb 14, 2012 : 1:28 a.m. Some players mention their high schools, because where they're from is more important to them than where they went to college. This is a hard concept to handle for a lot of people. Mon, Feb 13, 2012 : 9:12 p.m. The clips of the football players used were recorded some time ago. They weren't recorded for the Super Bowl specifically. Don't know why he used his high school at the time. Might have been a RichRod thing or something. Mon, Feb 13, 2012 : 8:54 p.m.
Mon, Feb 13, 2012 : 9:31 p.m. Thanks Jim for setting our troll friend Eric straight. Slither back to EL or TOSU, wherever u came from. Mon, Feb 13, 2012 : 9:15 p.m.
Manningham certainly did well at Michigan, especially in bursts. He scored 10 touchdowns in a six-game stretch in 2007 and eight touchdowns in a four-game run in 2006. And 27 touchdowns in three seasons is a good output for just about anybody. Mon, Feb 13, 2012 : 8:25 p.m. I noticed in the super bowl pregame as well-all other players mentioned their college, Mario did not. Is there a story here? Is there ill-will? Mario was in the middle of the RR transition perhaps that has made some bad feelings...complete speculation on my part. Mon, Feb 13, 2012 : 2:16 p.m.
at the super bowl manningham told the world that he was from 'warren g harding high school'. both david baas and tom brady proudly mentioned 'michigan'. not the kid from warren, o.
Mon, Feb 13, 2012 : 2:01 p.m.
Jim, I think the word is 'chillin''. Mon, Feb 13, 2012 : 9:13 p.m.
Yeah, I'm probably a little too formal. Manningham said it better than I can type it. Mon, Feb 13, 2012 : 8:38 p.m. I thought the exact same thing - 'chilling' sounds like the end of a murder mystery or something!